We still have quite a few gorgeous heirloom tomatoes ripening in our garden this week, and I can't think of a better way to feature ripe, juicy, sweet, garden-fresh tomatoes than a BLT salad! Although simple in its ingredients, this salad (with smoked almonds instead of the bacon for me) is one of my favorites, and received envious glances from both Rob's and my coworkers. Maybe next time we'll make enough to share! Make the croutons: preheat the oven to 425 degrees Fahrenheit. Toss the bread cubes with the 2 tbsp oil, salt, 1/4 tsp pepper, and garlic. Bake the croutons for 10 - 15 minutes, or until evenly dried and golden brown. Cool. Make the basil mayo dressing: whisk together the mayo, yogurt, buttermilk, vinegar, 1/4 tsp pepper, and basil until well blended. 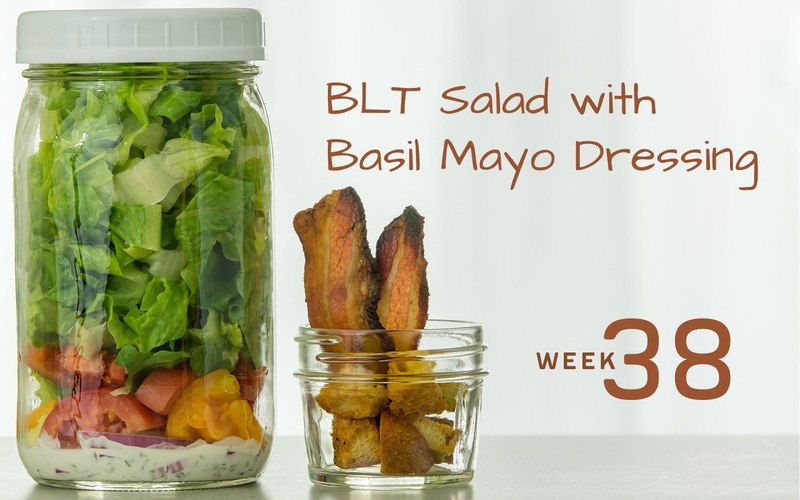 Pack the salads: divide the dressing evenly between each of 4 tall quart-sized containers. Layer the red onion, tomato, and romaine in the jars. 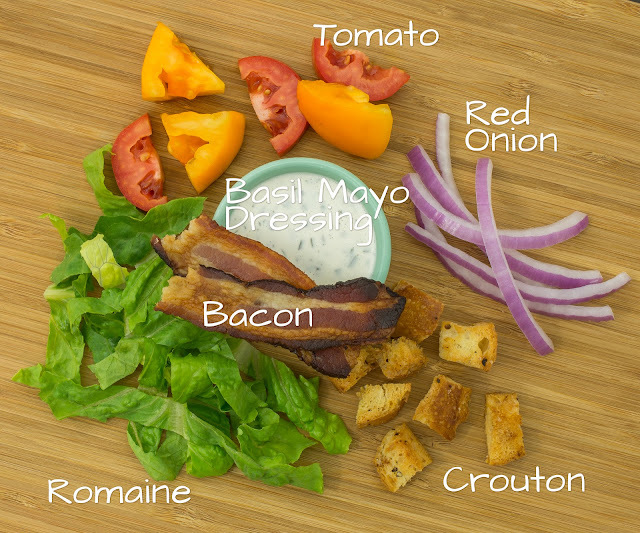 Divide the bacon and croutons evenly among 4 snack-sized zip-top baggies, one for each salad. Refrigerate until serving. Enjoy your salad: invert your salad onto a plate or into a bowl. Top with bacon and croutons. TIME-SAVING TIPS: Substitute precooked bacon for the cooked, crumbled bacon and store-bought croutons for the homemade croutons. SPECIAL DIET SWAPS: This salad is nut-free as-is. For a vegetarian salad, substitute smoked almonds, roughly chopped, for the bacon. For a vegan salad, substitute your favorite vegan mayo and plain vegan yogurt for the mayo, yogurt, and buttermilk in the dressing. For a gluten-free salad, omit the croutons or use your favorite gluten-free bread.